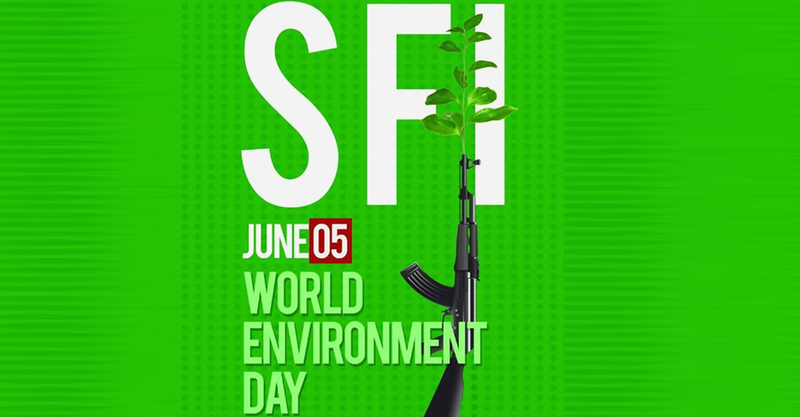 The Students Federation of India comes up with a strong and creative protest against the Thoothukudi shooting on the Environment Day. The central committee of SFI has urged its unit committees to plant 13 saplings on June 5 to pay tribute to the 13 anti-Sterlite protesters killed during the May 22 police firing against the protesters. There are almost 15,000 registered units for the organisation in schools, colleges and universities in the country said the Central Executive Committee member Nitheesh Narayan. SFI stated issues has part of this campaign says that the incident that the nexus between ruling class and corporate houses could violate any rights for their ultimate profit, though they have not succeeded. The saga of resistance showed the path. At the same time, we observe the challenges which are bringing our civilisation at the blink of disaster.” The protest is an ‘environment challenge’ to Prime Minister Narendra Modi. Since most of the colleges will not be functioning in Tamil Nadu, the event will be held in the district and state headquarters and village committees said the CEC member from tamil nadu. SFI was one of the organisations that took part in the month-long protest in Thoothukudi. “We played a key role in organising students during the protest,” says Suresh Pandian, SFI district secretary of Thoothukudi. SFI launches this protest campaign saying that In these dark times the sacrifice of 13 people to save environment in Thoothukudi is our inspiration.